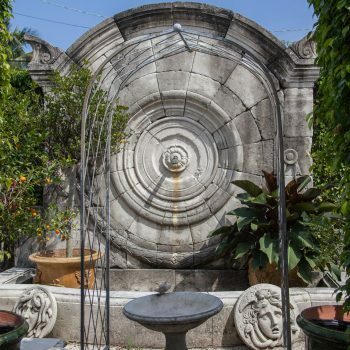 Late 18th Century, large monumental garden wall fountain, the antique back splash is adorned with a large centered swag typical for Louis XVI style, and the traditional French decor. Accentuated with a central rosette water feature. Large and wide half basin with four leaves or “quatre feuilles” with edge detail. Wear consistent with age and use. Spouts are sold separately. 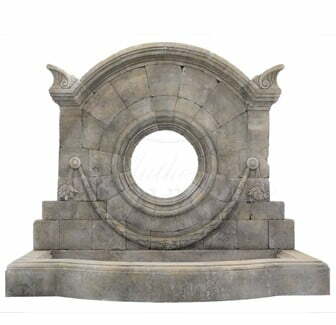 Please visit our extensive spout selection to personalize your fountain. Categories: Garden Fountains, Wall Fountains. Tags: FOUNTAIN, FRANCE, HAND CARVED ANTIQUE LIMESTONE, HAND CARVED LIMESTONE, LATE 18TH CENTURY, LIMESTONE, Louis XVI, quatre feuilles. 150 H in. x 171 W in. x 79 D in. Late 18th Century, large monumental garden wall fountain, the antique back splash is adorned with a large centered swag typical for Louis XVI style, and the traditional French decor. Accentuated with a central rosette water feature. Large and wide half basin with four leaves or "quatre feuilles" with edge detail. Wear consistent with age and use.